Preparation time: 7 minutes. Cooking time: 6 minutes. Heat grill. 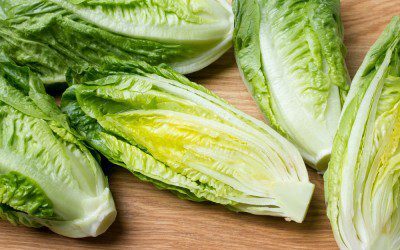 Cut lettuce head lengthwise in half, but do not trim off the base holding the leaves together; wash lettuce and pat dry. Spray a 12-inch piece of foil (or a larger piece, if needed) with nonstick cooking spray. Place lettuce halves on foil and place on hot grill. Grill each side of halves for 2 minutes until slightly browned. Remove from grill and cool. Cut off base, then slice lettuce horizontally into ribbons, about 1 inch wide. While grill is still hot, grill asparagus on same foil, turning constantly, until slightly browned. Slice asparagus diagonally into 1-inch pieces. Place lettuce and asparagus in a medium salad bowl along with sliced onion, tomatoes, and Parmesan cheese. Toss, add dressing, then toss again.